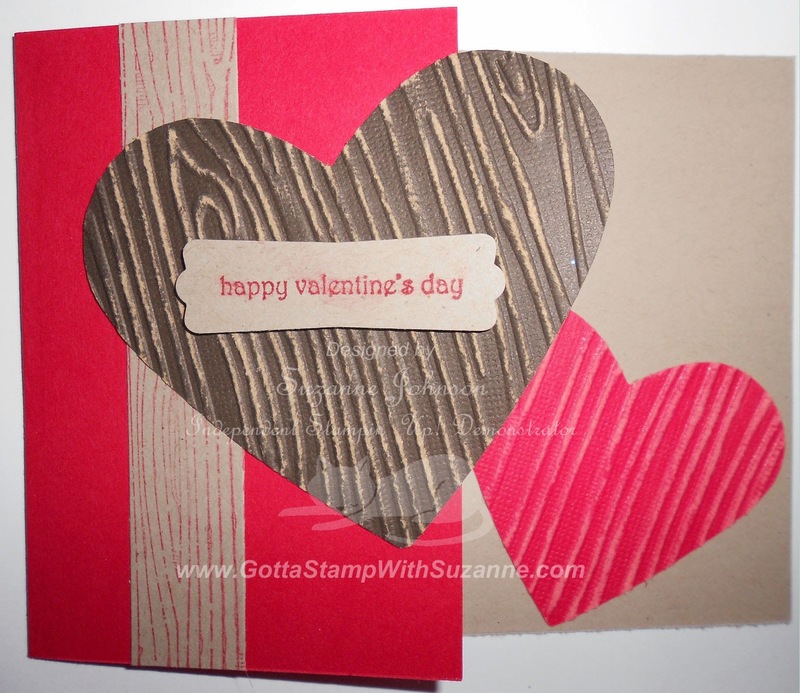 I absolutely LOVE woodgrain texture and this easy Valentine is all about the woodgrain, making it a great one for a special guy! It is even easy enough to make a bunch with your kids to give out to friends. You do need the Big Shot and related tools for this card. Materials and tutorial below the photos! The materials list looks long because I included EVERYTHING and the shopping info, but many of you will already have most of those materials - maybe all of them! Stamp inside sentiment on the Crumb Cake panel (top left corner) with Real Red ink and adhere to inside section of red card. Stamp Crumb Cake strip with Timber Stampin' Around Wheel and Real Red ink (if you have an ink cartridge for the handle use it, otherwise roll the stamp on the ink pad). Be sure to test on scrap paper. Adhere to front of red card. Cut Core'dinations Early Espresso and Real Red hearts with framelits, texturize with Woodgrain embossing folder and sand the raised parts on front side. 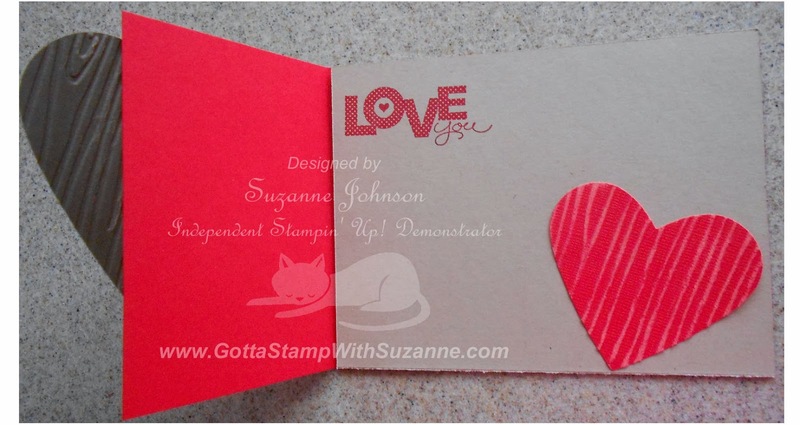 Adhere red heart to bottom right corner of Crumb Cake panel inside card, tilted so it shows when card is closed. Position where Early Espresso heart will go on card front, extending past right edge (it should overlap red heart) then adhere putting adhesive or glue only where it attaches to the red card front - not on the overlap or you will have a mess LOL! On Crumb Cake scrap, stamp Teeny Tiny Wishes Valentine sentiment with Real Red Ink; punch with Modern Label Punch and use Stampin' Dimensionals to adhere to card front on Early Espresso heart. thanks for always sharing your fun ideas. You are wonderful!!! Thank you so much, Sherrill! Your support means so much to me! Hugs! Great card and post Suzanne! Love all the details. Thanks so much Penny! I really appreciate it. I just spent the last hour replacing all my photos posted this week with watermarked versions - in my haste to get all these samples and tutorials up I completely forgot the watermarks!